What do you get when you have nine generations of magic flowing through your veins? What do you do when you carry the same magically irresistible name your father and grandfather proudly carried? What do you do when, at the end of it all, all you want to do is head bang to some good old ’80s heavy metal? The answer, my friend, is blowing in P. C. Sorcar’s hair. Not Jadu Samrat P. C. Sorcar, the internationally renowned, Padmashree-awarded magician who showcased Indian magic to the world in the ’50s. Not even Magician P. C. Sorcar (Young), who carried forward his father’s legacy with the same solemn pride. Meet the new age P. C. Sorcar — Magician P. C. Sorcar (Master), a.k.a. Pouroosh, who performed in Bangalore last month. The posters were up on the streets of Bangalore weeks before his scheduled performance. There was excitement in the air. The town hall, a Greco-Roman building reminiscent of old movie theaters in Calcutta, was alive once again. We bought chips and water and entered the world of India’s Greatest Magician. Our first discovery was that the pricey Rs. 300 tickets meant that we had to sit right at the back, with fans being an added grace. We waited impatiently. A bell rang, the lights were dimmed. A disco light flashed. And then all hell broke loose. Deep Purple, Iron Maiden, Def Leppard, and other rock gods exploded out of the speakers. The sidekicks appeared on stage, juggling and jumping. 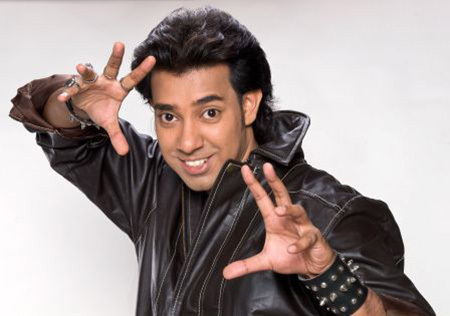 A strange anglicised Bangla (“Bonglo”) accent introduced us to the “greatest magician of all time”. And then, like a Bollywood hero dressed in a dazzling pink sherwani, Master P. C. Sorcar appeared in the middle of the stage with his hands jauntily on his hips, and a brilliant smile plastered on his face. Charming though he was, a magician he definitely was not. We waited impatiently. A bell rang, the lights were dimmed. A disco light flashed. And then all hell broke loose. It was to be a long night of theatrics, of dance and drama, of amplified sounds and screams. We were to be charmed into liking Master P. C. while disliking (on the verge of hating) his tricks, which were very old-school, involving heavy apparatus and very little illusion or sleight of hand. The drama was exaggerated, especially in tricks like ‘Passing Through the Deadly Blades of a Rotating Industrial Fan’ and ‘Sawing a Lady in Half’. ‘Indrajal’, the famous Sorcar-family trick of pouring never-ending ‘water of India’ out of a jug was disappointing. Aside from the performance being lacklustre, the trick itself seemed to belong to an era of Indian nationalistic propoganda, when appeals of Nehruvian “unity in diversity” were on the tips of our tongues. One trick we greatly enjoyed was aptly labelled ‘Soul Through Soul’ where Master P. C. “penetrated” a woman by appearing through her stomach while she screamed in pain. The surfeit of sexual innuendos kept us well amused for the next half hour. However, the evening went from bearable to bad. The post-interval half involved people in skeleton costumes dancing under U.V. lights. Master Pouroosh would glorify himself and his family lineage in his Bonglo accent every five minutes or so. This involved advertising his musical abilities, as the pianist and vocalist of a rock band. After persistently searching online, I found a video of his hilarious hit single ‘Soldiers of Paradise’. It is a must watch for Guns N’ Roses lovers. Tanvi Srivastava is a designer, plasticine-man maker and posthumously-successful writer, studying at Srishti School of Art, Design & Technology, Bangalore. She designs graphics and web sites for fun and money. She wants to write for fun and money but this has never been the case. Writing has tormented her from the raw age of five when she would pick up a pen and scribble unintelligible squiggles onto page after page of her maths notebook, desperately hoping that the squiggles would one day magically transform themselves into a semi-intelligible novel. That, of course, was not the case. The logic of this act defeated everyone, especially her mathematics teacher. She is currently working on her first incomplete novel, possibly titled 'Khadian Angst'.